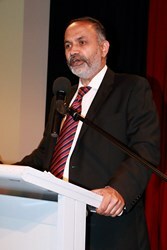 Jashn-e-Ashraf Shad was held in Sydney to celebrate the 70th Birthday of the famous poet, award winning novelist, distinguished political analyst and acclaimed journalist and broadcaster. 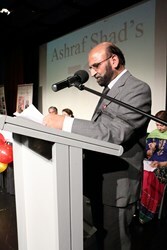 The event was organized by Ashraf Shad’s family and friends and with the support of Urdu International Australia. Dr Shabbir Haider. 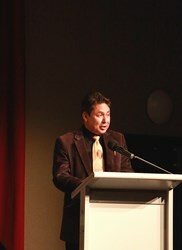 Dr Mansoor Syed and writer and poet Mohammed Ali travelled from Canberra to be part of the literary spectacle. Speaking at the dinner gathering attended by above 250 guests, Mujahid Barelvi advised Ashraf that after completing his new novel titled as ‘Judge Sahab’, he should avoid writing his next novel ‘General Sahab’. 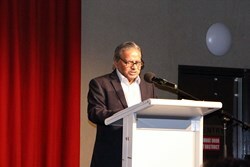 Mujahid, a long time crusader, spoke high of Ashraf’s literary achievements saying that Ashraf was one of the most prominent political fiction writers of contemporary Urdu prose landscape and his novels like Baiwatan, Wazeer e Azam, Sadr e Muhtaram were already enjoying a high pedestal in literary corners. Member of Order of Australia Prof Farhat Yusuf and Consul General Majid Yousfani appreciated Ashraf’s last 50 years work and wished its continuation with the same zeal and vigour. 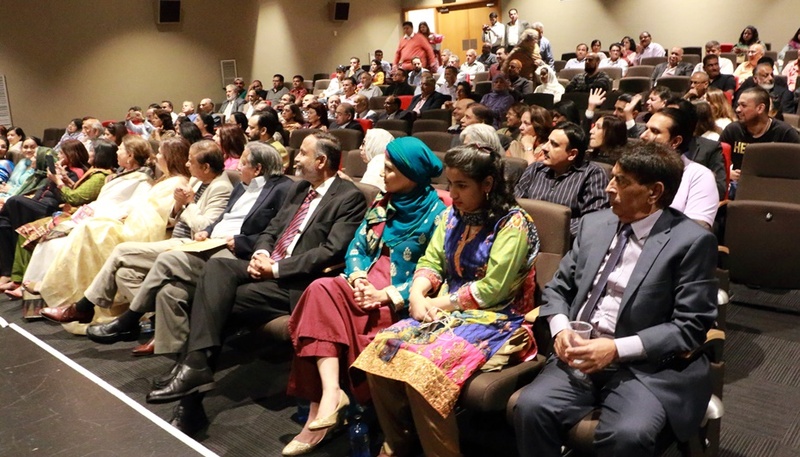 Drama artist Uzma Gilani opined that Ashraf was heart and soul of Sydney’s literary and cultural activities. She also recited in her own unique style some of Ashraf’s ghazals and nazms (poems). SBS Radio Hindi program producer Kumud Merani presented a selected excerpt from Bewatan, the award winning novel of Ashraf Shad. This was followed by Saba Abdi who read excerpt from Ashraf’s short story. 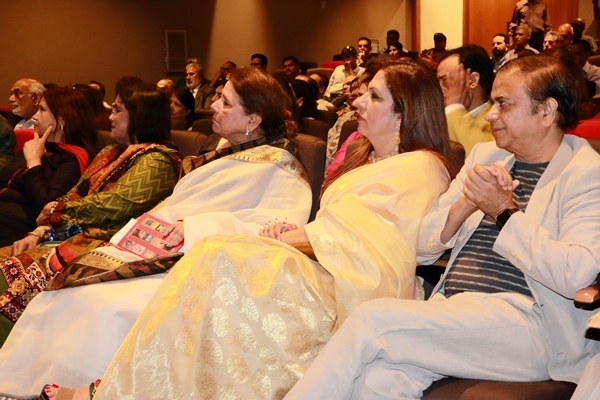 The guests also visualised Ashraf's poetry in motion when outstanding choreographer of Sydney Ms Jyoti Dixit danced on the tune of one of Ashraf's geets (song). This presentation was preceded by a ghazal sung by Mehreen Jawed. 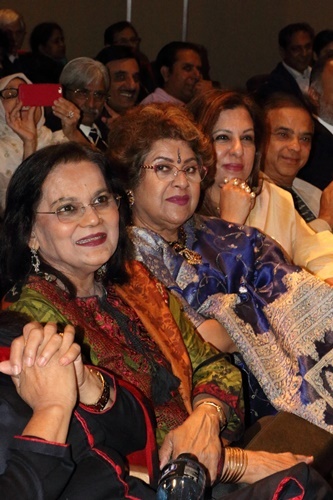 The gathering laced with acknowledgement of Ashraf’s work by dignitaries started in the evening and continued until late at night with all guests glued to their seats until the end. 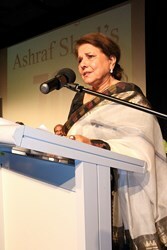 Early in the start of the program Prof Yasmin Shad, Ashraf’s life partner, welcomed all guests. Mohammed Ali who shared the role of Master of ceremony with famous poet Huma Mirza, recounted early days of Ashraf's poetry and said that Ashraf's talent had started showing right from the beginning of his literary journey. Prominent Sydney poet Arif Sadiq disclosed that Ashraf's work was the subject of an already awarded MPhil degree from Lahore's Garrison University while a research on his novels is undertaken by Punjab University. 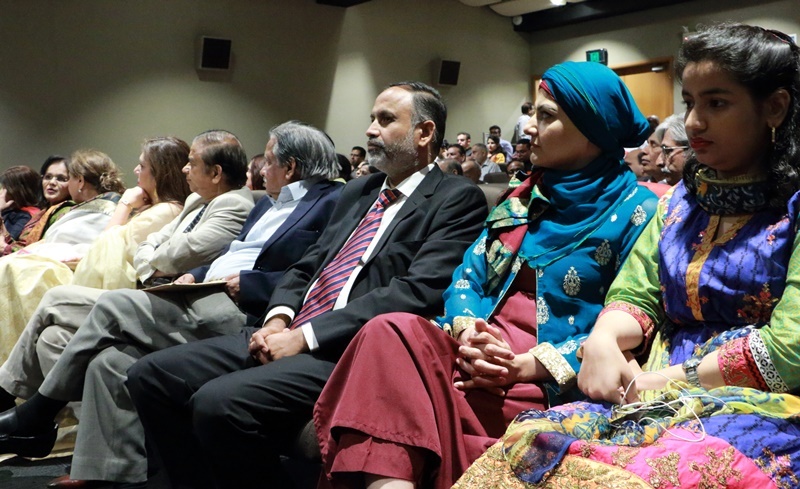 Distinguished poet and scholar Dr Baqar Raza presented a paper on Ashraf's literary contributions and Dr Shabbir Haider presented a chronology of Urdu literary activity in Australia with special emphasis on Ashraf's contributions. 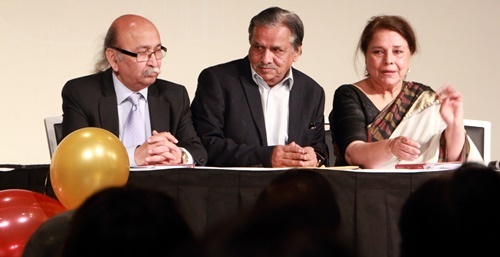 Representing Ashraf's family his daughter Saman Shad who is a playwright and a writer with Australian newspapers and ABC recounted her childhood memories saying how the family especially herself and her brothers suffered when Ashraf was jailed during General Zia Ul Haq's era in Pakistan. 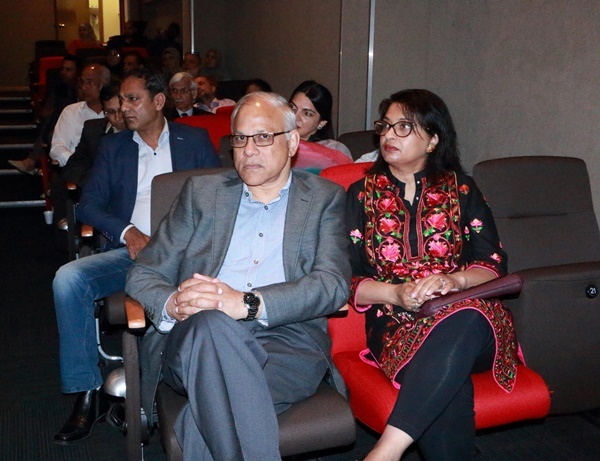 Other speakers who analysed Ashraf's work included Head of SBS Urdu Service and poet Rehan Alvi, Chair Koocha e Saqafat Sydney Javed Nazar, and renowned poet Farhat Iqbal. A message by Ms Oliya Boyar, Ashraf’s former Manager at the SBS, was read on the occasion. 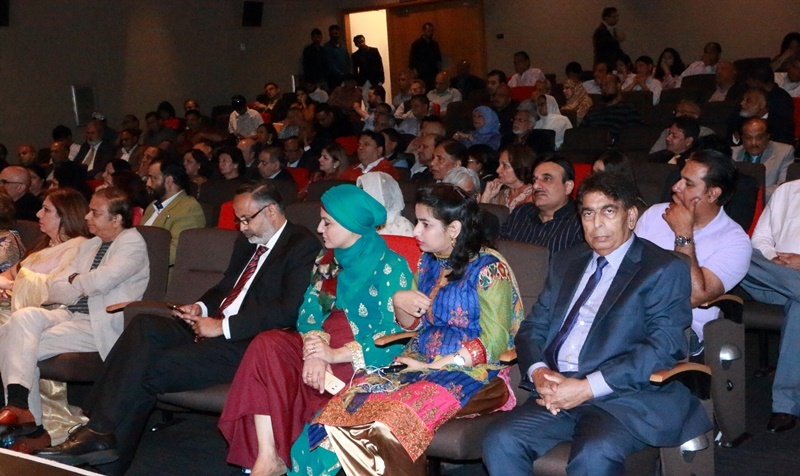 Among special guests who attended the evening included President Australia Pakistan Medical Association Dr Sayeed Khan, Chairman Edhi Foundation Australia Mr Hamid Khan and President of the Pakistan Association of Australia Mr Abbas Rana. The vote of thanks to conclude the evening came from Mr Bashir Malik.Ashraf shad, in the end, thanked all guests and admirers. He also presented one of his latest ghazals followed by cutting of a well decorated birthday cake surrounded by floral bouquets presented to him on the occasion.